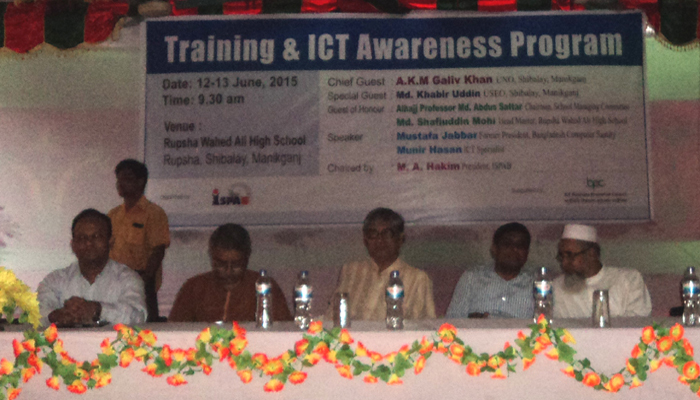 ISP Association of Bangladesh (ISPAB) in collaboration with IBPC (ICT Business Promotion Council) have successfully organized a 2 days ICT awareness and training program from 12th to 13th of June, 2015 at Rupsha Wahed Ali High School, Shibalay, Manikganj. The Program was inaugurated by the Mr. Emdadul Hoque, Secretary General, ISPAB. Mr. Gazi Zehadul Kabir, Director, ISPAB was the moderator of the program. Mr. A.K.M. Galiv Khan, UNO, Shibalay, Manikganj was the honorable chief guest of the program. Mr. Khabir Uddin, USEO, Shibalay Manikganj attended the program as the Special Guest. Alhajj Professor Md. Abdus Sattar, President, Rupsha Wahed Ali High School Managing, Committee and Md. Shafiullah Mohi were the Guest of Honour of the program. Mr. Faysal Khan, Executive Officer, ICT Business Promotion Council was present in the program. Mustafa Jabbar, Former Presient of BCS, Munir Hasan, the Prominent ICT Specialist; Gazi Zehadul Kabir, Director, ISPAB; Md.Shahidul Islam Dipu, Network General Manager, Dhaka Com Ltd and Mr. Fakrul Alam, CTO, BDHub Ltd were present in the program as the honorable Trainers. About 600 Students and 50 Teachers of the School and about 120 Persons from different Professions attended the Awareness Program. 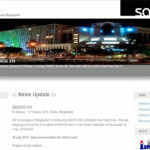 Getting to know about the global aspects of Internet security. After having depth knowledge on the merits and threats of using internet the remote people of our country will be more sincere, effective and careful while using internet, the power house of modern lifestyle and advancement. Bangladesh will be better able to protect its network from overseas threats and be able to prevent and mitigate new viruses and vulnerabilities. The young generation will be better prepared to use the Internet safely and effectively. They will be able to take part in fulfillment of the desire of making Digital Bangladesh. The Persons from different professions expressed their keen interest about learning how to improve their business through the newly invented scientific methods. The persons who are cultivating fish and fisheries asked to know how they can be able to avoid unwanted sudden death of fish. Through the use of internet it was shown to them. The farmers came to know about the new method of increasing grow of the crops. The personnel from the industrial business had a deep knowledge how to implement digital technology on their business and save time, labour and money in the same time. They were highly delighted to be the part of such a fruitful workshop and expressed their wish that they will try their best to have the benefits of using internet and implement it into their respective professions. The closing ceremony was held at 5:00 PM on 13 February, 2015. The participants were highly glad to have such kind of program in their School. The president of Rupsha Wahed Ali High School Managing Committee thanked ISPAB and IBPC for arranging such an effective program in their school and requested to arrange another program in their school.